Celebrate Valentine’s Day this year with the Love Locks Community Open Day event at Queen Victoria Market. The Love Locks Project initiated by the City of Melbourne commissions artists to repurpose padlocks removed from Southbank footbridge. Craft Victoria has been entrusted to facilitate the Love Locks Project, culminating in an exhibition, series of mementos and charity auction. Members of the public are invited to view a selection of the locks before they are transformed into artworks. 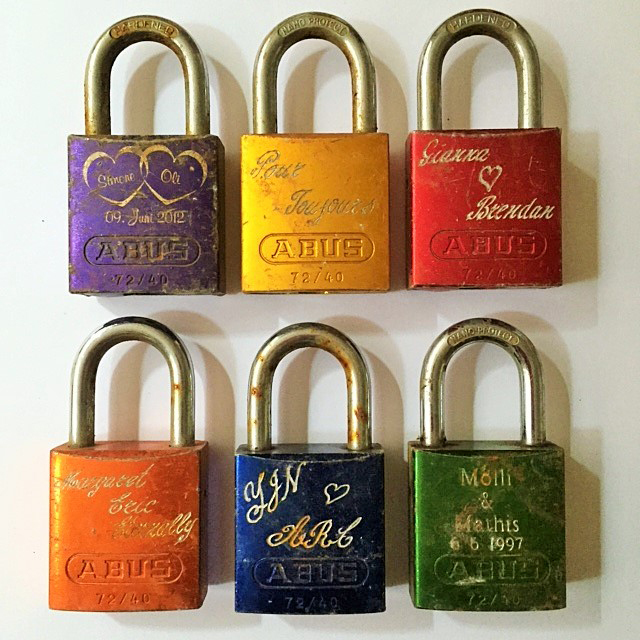 This day celebrates the initial intention of the locks as acts of devotion and allows the sharing of stories surrounding the locks that continue to give them history and meaning. Jane Scott, Artistic Director and CEO of Craft Victoria said that the Love Locks Community Open Day was one last chance to see the locks in their original state. ‘The open day is the perfect opportunity for the public to view the locks and to share their stories and ideas around the project,” Ms Scott said. “Next month we will announce the successful artists who will be creating unique and innovative artworks from the locks. As we move into the next phase of the project, which involves documentation of the locks, the artists and their craft techniques, and ultimately a public exhibition and a charity auction of the works – this is a fantastic opportunity to share your story and hear from others about the significance of the locks,” Ms Scott said.